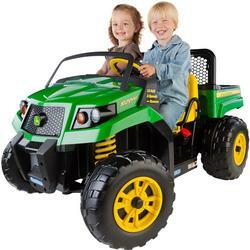 Peg Perego John Deere Gator XUV is the perfect riding vehicle for little helpers. 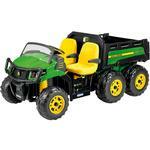 Theyll tool around the yard in their own John Deere Gator, hauling everything imaginable in the extra-large dump bed with opening tailgate. The 2 speeds plus reverse (2 1/4; 4 1/2; mph) with second gear lockout for beginners; Knobby tread wheels provide traction on grass, dirt, gravel or pavement. 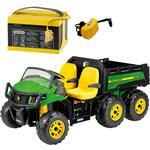 ;Detachable, extra large stake side trailer; Working FM radio with electronic tuning; Adjustable seat with flip-up armrests and a cupholder; 12V rechargeable battery and charger included; Weight capacity: 130 lbs. Measures 67 1/2 x 26 1/2 x 24 1/2"
Your childs Peg Pérego riding toy will never run out of juice when you have this 12 volt rechargeable spare battery on hand. Swap it in when the riding toy runs down for non-stop fun. 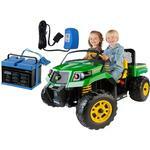 For use with Peg Perego High-Performance 12 Volt Childs Vehicles. 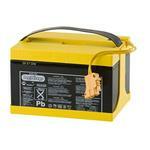 For use with Peg Pérego High-Performance 12 Volt Childs Vehicles. Amp Pac Toy Battery Charger Fits all 1999+ Peg Perego 12 Volt Models, MECB0034, John Deere Gator, John Deere Worksite Gator, Gaucho Silver Edition, Desert Challanger, Bandolero, Corral Thundercat, Tundercat, T-Rex, Corral Princess, Rodeo, Apache, Gaucho Grande, Lightning, Gaucho 4.0, Power Oull Tractor, Ride On Toys.